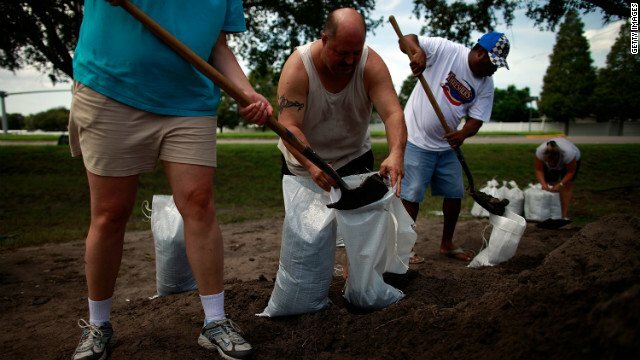 People in southern Florida have been making final preparations for Tropical Storm Isaac, as it barrels to the US. Hundreds of flights and sailings have been cancelled, high winds have already caused power cuts and oil rigs are facing possible closures. Other US states are also on alert as forecasters warn that Isaac could strengthen further. The storm has already caused havoc in the Caribbean, killing at least six in Haiti and bringing floods to Cuba. The National Hurricane Center said the storm was moving at about 20 mph (30km/h) towards Florida’s southern tip, and was expected to begin battering the coastline during the day on Sunday. It was packing sustained winds of 65 mph. Residents of the Florida Keys, a thin island chain connected to the mainland by a single road, have been driving north all weekend. They are well-used to the ritual of storm preparation, and many have boarded up their homes and businesses in preparation. A few bars and restaurants stayed open late on Saturday to serve small groups of tourists and locals willing to risk the storm. “We’ll just catch every place that’s open,” holidaymaker Ted Lamarche told the AP news agency. Hurricane watches were put in place along the coastlines of western Florida, Alabama, Mississippi and south-eastern Louisiana. Florida Governor Rick Scott declared a state of emergency to make sure emergency services would be ready when the storm hit. The Republican Party has been forced to delay the start of its national convention in the western Florida city of Tampa because of the storm. The eye of the storm is forecast to hit the US coastline further north, but with its effects felt up to 230 miles away, Tampa is expecting a soaking and powerful winds. The Republican party, which is due to formally nominate Mitt Romney as its presidential candidate during the meeting, said the convention would begin on Tuesday, a day later than planned.